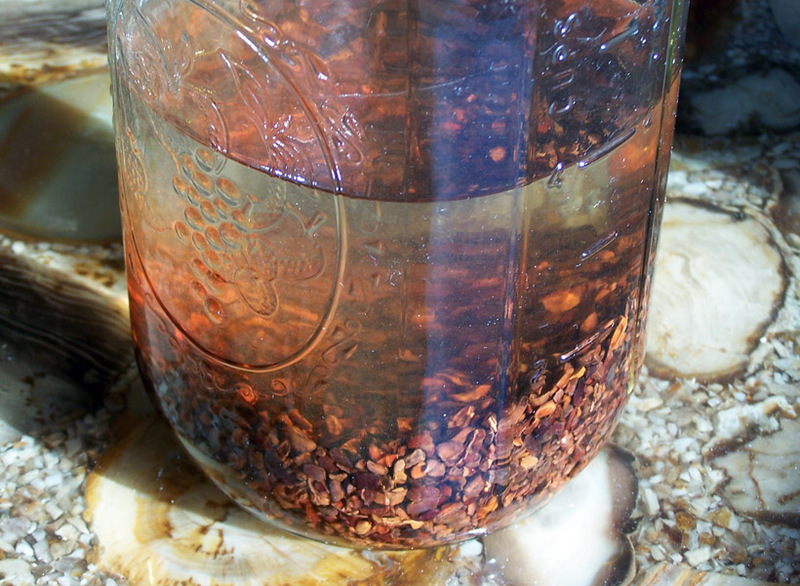 I allowed this mixture to infuse for two weeks, agitating daily. After two weeks, it had taken on a rich chocolate brown color, and a strong, but incomplete flavor of the cacao. The secret to making an excellent liqueur in this style is to realize that only some of the flavor compounds in the chocolate are alcohol-soluble, whereas others are water-soluble. To create the fullest, roundest, most accurate chocolate flavor, you have to have both a water and an alcohol extraction. Moreover, a liqueur is supposed to be sweet, so it is necessary to add sugar. I took another four ounces of Theo chocolate nibs and simmered them in a pot with water and sugar in a ratio of 1:1 for half an hour, until I had a dark, sweet chocolate syrup. The syrup did thicken from the sugar, but it retained the viscosity of simple syrup, because there was no melted chocolate. I knew I wanted a final spirit with a proof of 100 (50% abv), so I added 375 ml of the syrup to 750 ml of the infused spirit. This is a fun little algebra problem, which is trivial to solve using the numbers in this case, but if I had wanted a different target proof, the problem becomes slightly more fun. I leave it as an exercise for the reader, because math is almost as fun as drinking, and I would not want to deprive you. Stir over ice and strain. Express the oils of a lemon peel over the top and then drop it in. Drink in front of some leather-bound books. Under-appreciated drinking fact: leather-bound books add 50% to the classiness of any drink. 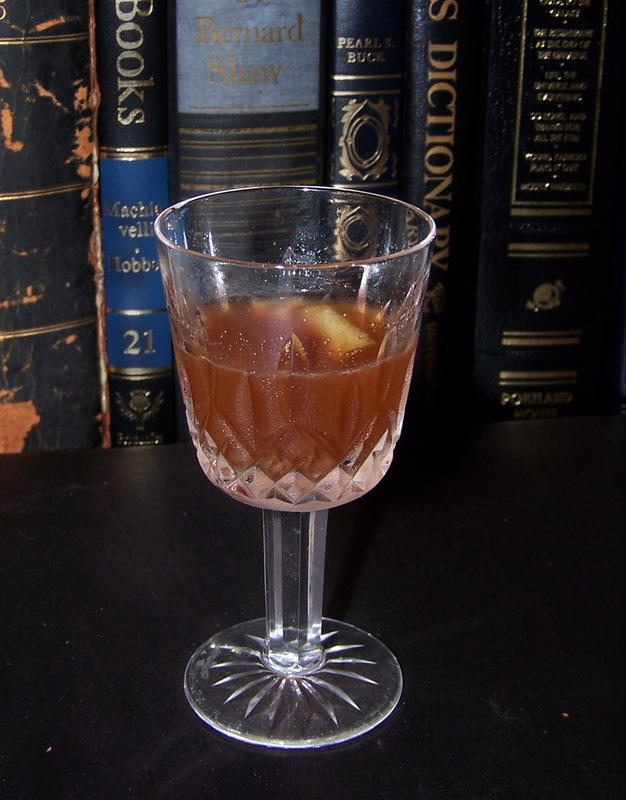 The slight bitterness from the sweet vermouth softens the sugar and the alcohol in the chocolate, while lemon oil adds a complexity and a bright tone that would otherwise be lacking. Even so, this drink is on the sweet side, which is why I kept it small. Moving on, one of my all time favorite cocktails is called the Rodriguez, which I was fortunate enough to order at the Teardrop Lounge when I visited Portland last March. The Rodriguez uses blanco tequila cut with mezcal and Benedictine to great effect, and it tastes like a walk in the desert, when the sun is just barely starting to rise, and the air is still cool. 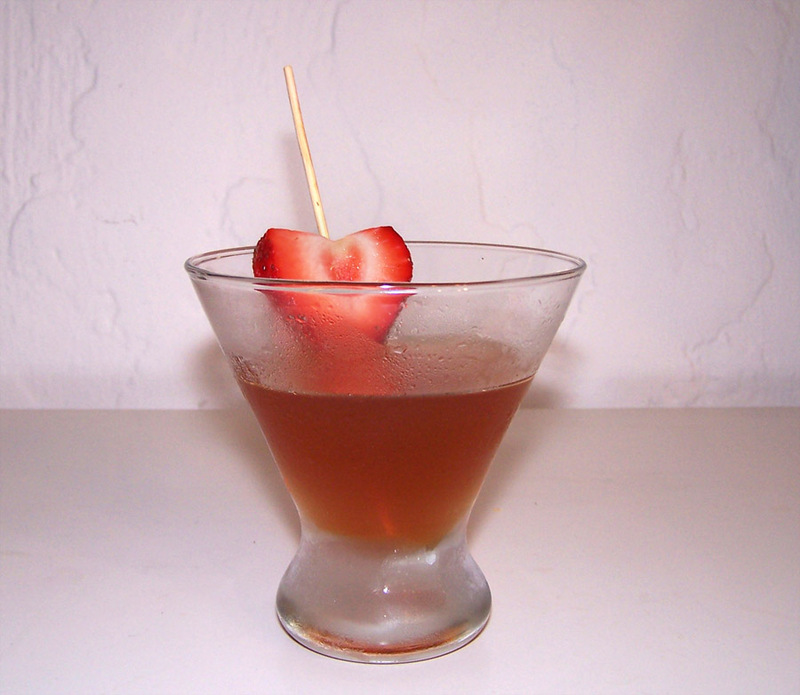 Truly, it is perfect, and yet, humans cannot resist the urge to meddle with perfection, so I created a variation by swapping out the Benedictine for my chocolate liqueur, and using strawberry-infused blanco tequila. The result was probably more appropriate for Valentine’s day, which is long-past, but the mezcal helped it retain its Mexican flavor. The result was strikingly similar to the original, while still capturing the flavors of chocolate and strawberry. Stir over ice and strain into a cocktail glass. Garnish with a strawberry. The character of this drink was feminized by the addition of fruit and chocolate, so we decided to call it Rafaela, after a beautiful girl that James used to know when he lived in Mexico. Categories: infusions, modern drinks, original creations | Tags: aperitif, benedictine, bitters, booze, cacao, cacao nibs, chocolate, chocolate bitters, chocolate liqueur, cocktail, cocktails, drinking, dry vermouth, homemade, infusion, lemon peel, liqueur, mezcal, mixed drinks, strawberry, sweet vermouth, tequila, theo, theo chocolate, vermouth | Permalink.